Missed Learning Solutions? Explore a wide variety of award-winning DemoFest projects from the conference built by your peers. Register today to learn how these projects were created and get some helpful new ideas you can apply to your work! Every year at Learning Solutions Conference & Expo, dozens of conference participants show off their unique learning projects at DemoFest, offering attendees the opportunity to see a variety of solutions to common learning challenges and share information about the tools, technologies, and processes used to build them. Meet several of this year’s winners in the complimentary Best of DemoFest Webinar, and explore how they build their award-winning solutions. 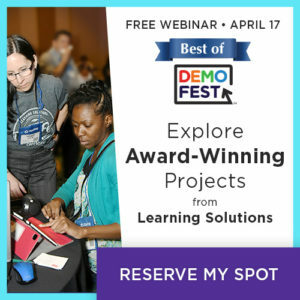 This webinar showcases some of the award-winning learning projects presented during DemoFest at Learning Solutions 2019 Conference & Expo, now available to all through this special online presentation. Register now and get some great new ideas that you can apply to your work!